Russia sent three military communications satellites into orbit Tuesday aboard a converted ballistic missile launched from the Plesetsk Cosmodrome, marking the first space launch of 2013. The Rockot launch vehicle lifted off at 1625 GMT (11:25 a.m. EST), turning northeast from the Plesetsk launch base on a nearly two-hour mission to put three communications satellites in an orbit 900 miles above Earth. Liftoff occurred at 8:25 p.m. Moscow time from Plesetsk, a military-run space center about 500 miles north of the Russian capital in Arkhangelsk oblast. The Rockot is a modified two-stage missile built to deliver nuclear payloads to distant targets. Engineers converted the wartime weapon, known to Western observers as the SS-19, to a peacetime space launcher by adding a third stage to inject satellites into orbit. The Breeze KM upper stage was supposed to inject three satellites in an orbit more than 900 miles high with an inclination of about 82.5 degrees. Russia did not identify the payloads on the launch, but the rocket's target orbit indicated the mission carried a trio of Rodnik satellites designed to relay messages between military users posted in remote areas. The satellites will likely receive the official names Kosmos 2482, Kosmos 2483 and Kosmos 2484 under Russia's naming system for military spacecraft. Khrunichev, the Rockot and Breeze KM prime contractor, announced the booster deployed the payloads at 1809 GMT (1:09 p.m. EST). Russia's Novosti news agency reported the launch was successful. The mission was the first space launch of 2013, and it marked the first use of a Breeze upper stage since a similar vehicle ran into trouble during the launch of a Proton rocket in December. The Proton rocket, which launches commercial communications satellites with the Breeze M upper stage variant, has been grounded since a Dec. 8 launch left Russia's Yamal 402 spacecraft in the wrong orbit. Engineers used the satellite's on-board thrusters to place the craft in the correct orbit, and Yamal 402's operator declared it operational in early January. The Dec. 8 mishap was the fourth anomaly of a Breeze upper stage, including on Rockot and Proton flights, since the beginning of 2011. Russian investigators have finished an inquiry into the Dec. 8 launch, but the report must pass a Russian security review before it is released publicly. 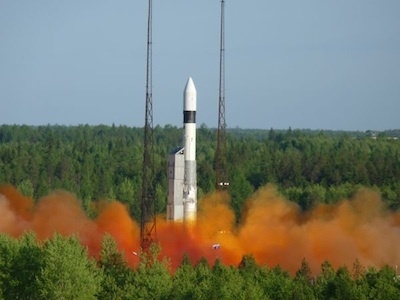 Proton launches will resume after corrective actions address the cause of the Dec. 8 anomaly, according to International Launch Services, the U.S.-based, Russian-owned company in charge of commercial Proton missions.